Composed by Chrissy Ricker. Center Stage Solos Series. Collection. 24 pages. Neil A. Kjos Music Company #WP1177. Published by Neil A. Kjos Music Company (KJ.WP1177). The prelude is a genre that spans all style periods of piano music. From Bach, to Chopin, to Gershwin, preludes have been written by a multitude of composers and in a wide variety of styles. 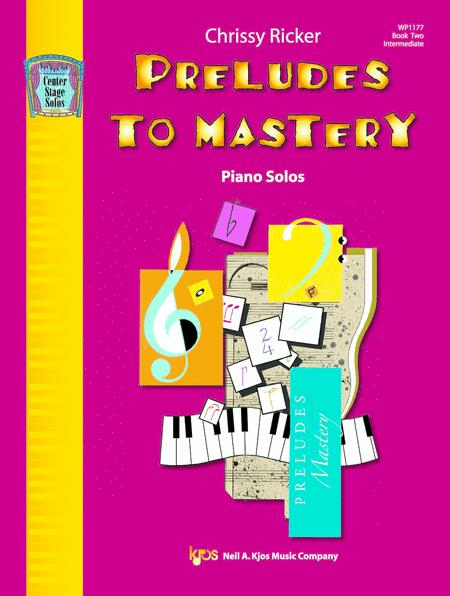 In these preludes, each in a different key, students are introduced to characteristics of the Baroque, Classical, Romantic, and Contemporary styles. These solos serve as excellent recital repertoire and as stepping stones to standard piano literature by the masters. Book 1 has common key signatures with 3 or fewer sharps or flats, Book 2 advances to keys with more sharps or flats. Book 1 has Preludes 1 to 11 and Book 2, Preludes 12 to 20.